The Eglu lets chicks roam, safely. I always wanted chickens so one year, for my birthday, my husband bought me an Eglu which is a British invention that makes keeping chickens easy and keeps the chickens safe, too. 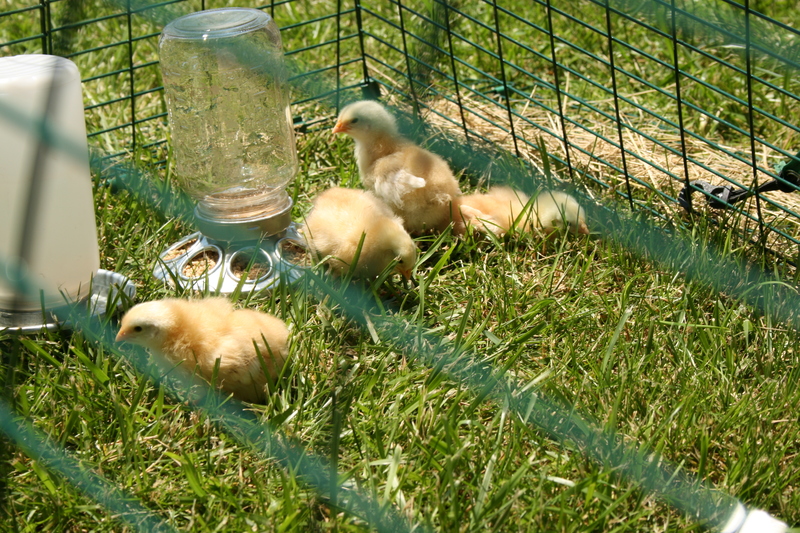 Once I got their home assembled, it was time to order the chicks! Because it can get to -20 where I live, I wanted a hardy breed. Research told me that the New Hampshire Red would fit the climate and lay beautiful, brown eggs. So I ordered 4 baby chicks from McMurray. NOTE: in case you’re wondering, no chickens died in this story….well they did die but they were old ladies by that time. My brooder looked like this one from Seattle Seedling. 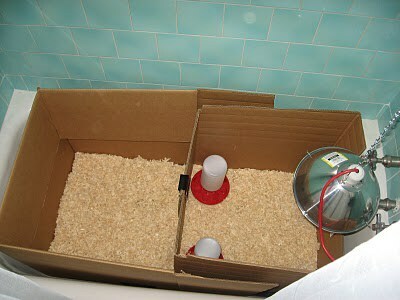 box, wood shavings (like the ones I use in my horse’s stall), a brooder heat lamp, a galvanized waterer and a little galvanized chick feeder. When my one-day old chicks arrived in the mail, I was all set. 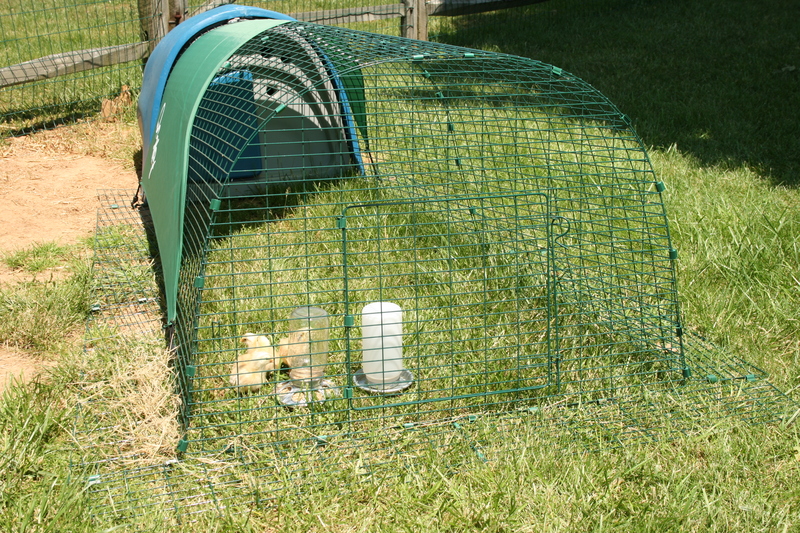 Within a week, they were outside and in their Eglu. The Eglu keeps the chicks safe as they explore the yard. Here, you see them dining al fresco — enjoying the sun and fresh air without worrying about predators like the hawks and fox that are our neighbors. So, I was all set for my backyard adventure with chickens, I thought. However, even though I bought and read the top books on having hens in your backyard and even though I only got 4 baby chicks, I wasn’t really prepared for getting, raising and caring for chickens. In fact, once the chickens and I got down to business, I had more questions than answers! I think if I had known all the things that could go wrong, I never would have gotten chickens. But I did and everyone survived. If I had it to do over, I would still read and research but I’d also get some hands on experience, too! 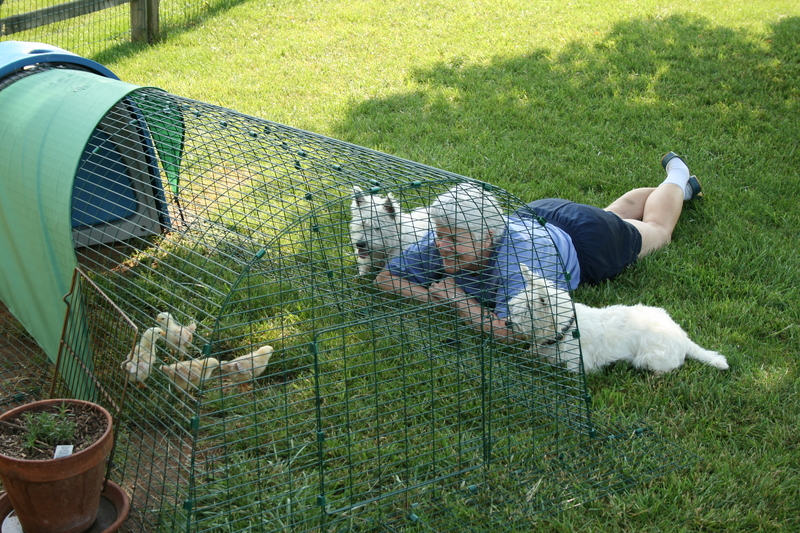 Chicken watching with my Westies who seem really interested. If you have a friend who already has chickens, visit, watch and learn. If not, universities, county extension offices and some hatcheries offer beginner classes. Or, if your lucky enough to live anywhere near Hockessin, Delaware, you could sign up for the backyard chicken class being held at Mt. Cuba on Saturday, April 2nd! If you do get into backyard chickens, there are also tons of forums where people just like us are happy to share what they know! And if you’re an organic gardener, chickens are some of the best organic pest control I can think of!